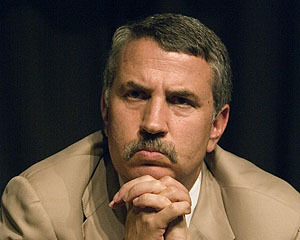 Tom Friedman: Good or Evil? corporate taxes, argued Otellini, and we “started one or two more projects in companies around the country that made them more productive and more competitive, the government’s tax revenues are going to grow.” With the generous research and development tax credits and lower corporate taxes they receive, Intel’s chief competitors in South Korea basically have “zero cost of money,” said Otellini. He reprints entire PR messages from eager CEOs without any apparent sense that of course these guys think their companies are doing world-shaking things. I spent the decade of the 90s as a marketing executive at a software company, and these kinds of breathless paeans are sadly familiar to me. But Friedman remains resolutely credulous in the face of these gales of corporate spin, and in the end, his corporate triumphalism becomes an idée fixe….Every CEO he talks to is brilliant, insightful, and far seeing. Raising his own everyday experiences to the level of epiphany is yet another. He figures out one day that Southwest Airlines allows you to print a boarding pass on your computer, and it immediately becomes a strained metaphor for a global convergence of technology and human psychology. The chairman of Starbucks tells him they offer soy milk because their customers asked for it, and he presents this mundane act of satisfying customer demand as something new and visionary. This is what makes Friedman so infuriating. His basic thesis, as it often is, is fine in today’s column: Education is important, innovation and entrepreneurship are important, and American competitiveness is important. Even his tin-earred penchant for oversimplification is understandable. It might drive me nuts, but he’s writing for a wider audience than just people like me. So that’s fine. But then there’s his actual narrative, which is so interwoven with almost childlike reverence toward the banal sayings of the rich and powerful that it’s enough to make you throw his books across the room and swear off reading forever. If I want to immerse myself in breathless corporate spin, after all, I can always turn on CNBC. But here’s the question that always gnaws at me: on balance, does Friedman do more good than harm? I genuinely don’t know. He really does have a huge audience, he really does explain things in a way that probably appeals to a lot of them, and for the most part his hobbyhorses are basically decent ones: clean energy, climate change, dealing with globalization, improving education, etc. He’s mostly given up his cheerleading for endless war, too. So does that make up for his corporate shilldom and other assorted sins? I’m not sure.